Congratulations are in order for MCB graduate students Mariela Petkova from the Engert Lab and Patrick Stoddard from the Murray Lab. 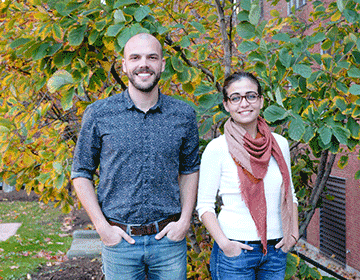 Each has been selected for prestigious HHMI and NIH fellowships, respectively. Originally from Bulgaria, Petkova is one of 45 students to receive this year’s HHMI International Student Research Fellowship. International students in U.S. graduate schools often have difficulty securing funding to support their research, as they are ineligible for federal fellowships, training grant support, and other governmental opportunities reserved for students who are U.S. citizens. Established in 2011, the fellowship supports international life sciences graduate students between their third and fifth years of school in the U.S.
A PhD student in the Molecules, Cells, and Organisms (MCO) program, Stoddard investigates how metabolic networks regulate activity in response to rapid changes in environmental nutrient concentrations. Using budding yeast as a model organism, so far he has found that a glycolytic enzyme polymerizes into actin-like filaments upon reintroduction to a glucose rich environment, limiting its activity. He is currently working to understand the observed molecular phenotype’s physiological effects.